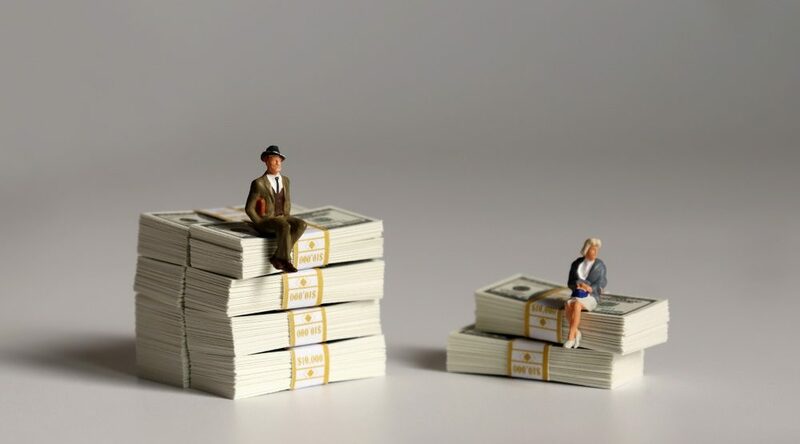 Following up on Glassdoor Economic Research’s initial study in 2016, the new report titled Progress on the Gender Pay Gap: 2019 looks at gender pay gaps across the globe, specifically in eight countries including Canada, the United States, and the United Kingdom. The remaining countries assessed are Germany, France, the Netherlands, Singapore and Australia. Glassdoor, the global employee review platform, looked at things like salary reports to help predict estimates. The sample salaries were reported from 2016 through to 2018. The US sample contains over 425,000 salaries reported on Glassdoor’s website. For Canada, the company measured 21,008 Glassdoor salaries reported by Canadian employees. Workers must have been working full-time and over age 16 in order to be part of the measurement. Men earned more than women on average in all eight countries studied. The report did note the pay gap has narrowed a bit since the 2016 study, though. In Canada, a woman earns 84 cents to every $1 a man earns, according to Glassdoor findings. Back in November, Statistics Canada said this pay gap was better with the Labour Force Survey showing women apparently earning 87 cents to every $1. 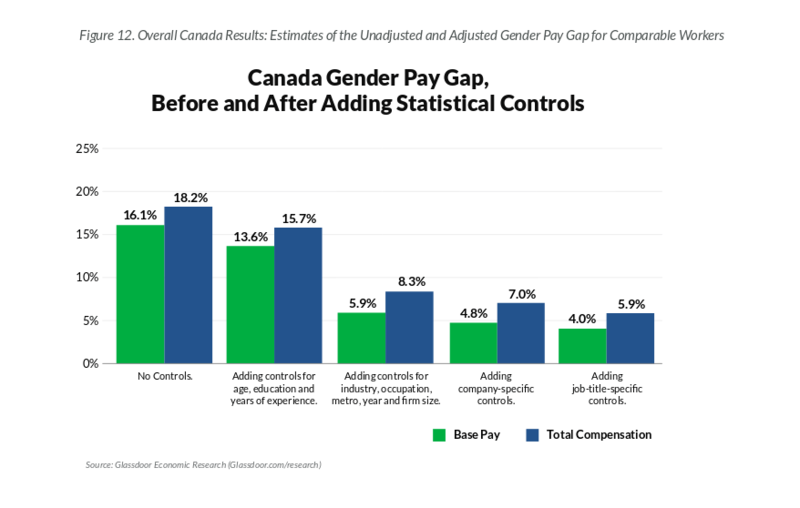 In total compensation, there is an 18.2% gender pay gap in Canada. Canada has the sixth-largest unadjusted gaps (16.1%) in base pay between men and women of the eight countries surveyed. France had the lowest gap at 11.6%. Germany (22.3%) and the United States (21.4%) were the top two unadjusted gaps. This percentage is the ‘pay advantage’ percentage that a male has compared to a woman. But let’s focus on this: the average base pay per year for men in Canada was $64,966 and women took in $54,740, according to the report. That’s over a $10,000 pay differential between the two genders, according to Glassdoor findings. This is, however, one report and should be read with that in mind. The report looked at 5,496 Canadian employers and 4,755 job titles–the sample was 62% male and 38% female and the average age was 33 years with just under five years of applicable work experience. 70% held a bachelor’s degree, 19% had a master’s degree and 8% came with a high school diploma only. Below looks at both the unadjusted (with no statistical controls for differences between workers or jobs) and adjusted numbers, showing base pay and total compensation. 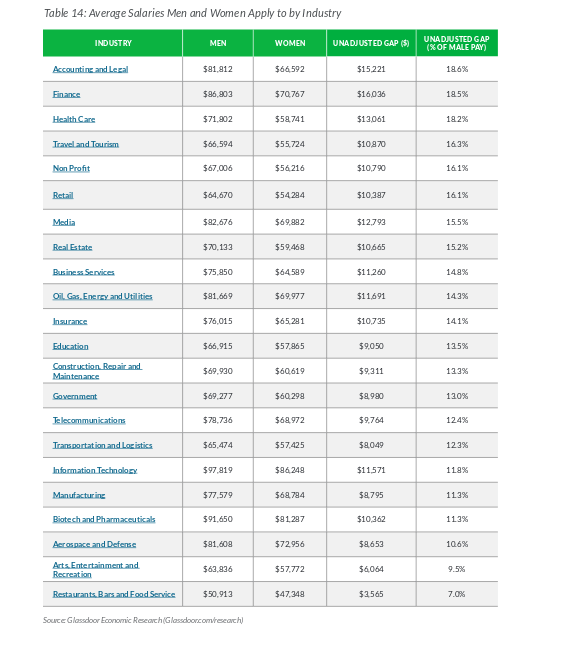 This table provides a stronger margin of accuracy because the adjusted pay gap factors in characteristics like a worker’s age, education, occupation, job title and so on. Above the two graphs looks at the unexplained and explained differences in worker characteristics. The unexplained portion remains “due to either unobserved factors or subtle forms of workplace discrimination,” according to the report. Key to remember is that when the numbers were adjusted Canadian women were earning 96 cents to every $1 that a man earns, which is positive. Across each country women earned on average between 93 cents and 97 cents earned by men, according to the report. In comparison to the 2016 study, the new report found the United States, the United Kingdom, France and Australia had seen the most improvements in the gender pay gap. Only Germany say an adjusted gender pay gap increased slightly from 5.5% to 6.4%. 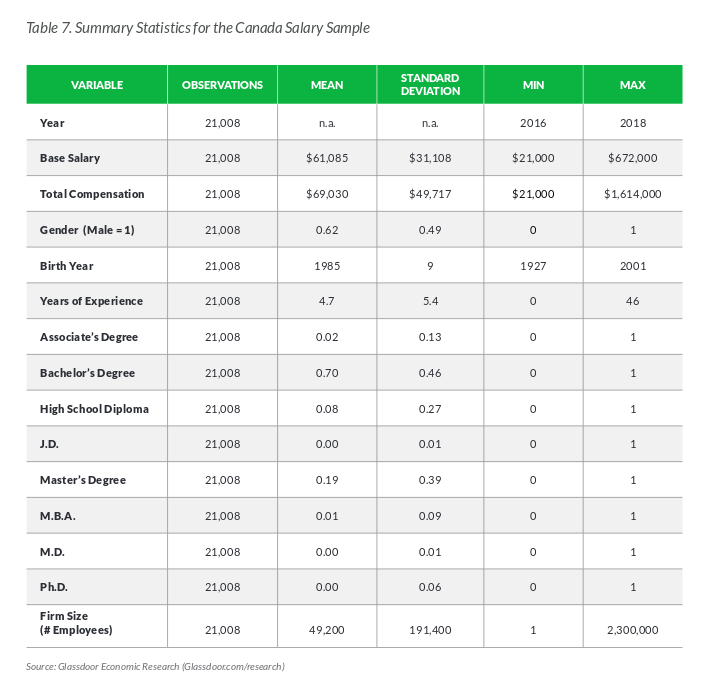 Canada: 21,008 Glassdoor salaries reported by Canadian employees. United States: 426, 512 salaries for full-time workers between ages 17 and 92 (as of 2018) *The study was more robust for the US. United Kingdom: 40,764 Glassdoor salaries reported by UK employees. Australia: 6,795 Glassdoor salaries reported by Australian employees. Singapore: 5,096 Glassdoor salaries reported by Singaporean employees. Germany: 4,794 Glassdoor salaries reported by German employees. France: 3,471 Glassdoor salaries reported by French employees. The Netherlands: 2,514 Glassdoor salaries reported by Dutch employees. The industries that have shrunk gender pay gaps the most (in the US, keep in mind) are within the non-profit sector (2.1% decrease in pay gap since 2015), health care (1.5% decrease in pay gap since 2015), and real estate (1.4% decrease in pay gap since 2015). Other industries that have seen decreases, according to Glassdoor, are business services, insurance, transportation and logistics, and education.